This page has example ESL supermarket conversations so you can see what a natural conversation would be like. Having conversations is often difficult for English learners, so this page lets you practice using English about supermarkets to have conversations. There are both example ESL supermarket conversations and conversation exercises for you to use on this page. You can look at the example conversations to see how to use supermarket words when talking about your shopping; you can also watch the conversations as they have been made into short cartoons. Then you can do the exercises as a way to practice using the vocabulary and to practice speaking. If you have any problems with any of the supermarket vocabulary you can look at the ESL supermarket vocabulary page for some help. Situation: Jane is shopping in the supermarket and bumps into her friend Lucy. Lucy: I didn't know you were coming to Tesco this afternoon. Jane: I always shop in Tesco on a Tuesday. Jane: There are not so many shoppers on Tuesdays. Lucy: I usually shop on a Monday but I didn't feel well yesterday. Jane: Oh, I'm sorry. I hope you are feeling better today. Jane: I am going to buy some apples. Lucy: I will come with you. I want to get some apples. Jane: I like sweet red apples. Lucy: I prefer the crisp green apples. Jane: Bananas are my favourite fruit. Lucy: Do you like pears? Jane: Yes. I eat lots of fruit. Lucy: The mushrooms look very good. I will buy a punnet. Jane: Yes. I will also buy some mushrooms. Lucy: When I get home I will make some mushroom soup. Jane: I enjoy eating mushroom omelettes. Jane: To make my omelette I will need eggs. Lucy: Would you like to try some of my soup when it's made? Jane: That would be lovely. Lucy: I'll bring some round at 6 p.m.
Jane: Will you be able to stay and have an omelette? Lucy: Yes I will, thank you. See you at 6 tonight. Situation: Jane continues to shop in the supermarket and she meets her friend Tui. Jane: Hello Tui. How are you? Tui: I am fine thank you. I need to buy rice and also some fish. Jane: What sort of rice do you need? There are so many different varieties, I find it very confusing. Tui: I want long grain rice. The Tesco own brand rice is the best and it is cheaper than other brands. Can you show me, Jane, where to find fish in the store? Jane: Do you want to buy fresh fish, frozen or tinned fish? Tui: I am wanting tins of Tuna. Jane: They are stacked in aisle 19, the middle of the shelf. I used to work here on Saturdays a little while ago so I remember where most products are displayed. Tui: I notice that they keep changing the position of goods and I find that confusing and very time consuming. Jane: Yes, I agree. Here are the tins of tuna, next to the pilchards. Tui: That's handy. I'll buy some pilchards as well. My cats love pilchards in tomato sauce. Jane: You spoil your cats. Tui: Yes I do but they only get pilchards occasionally. Jane: My dog will eat anything including my slippers if I don't hide them! Tui: Do you need to buy slippers? Jane: No not today. I have finished shopping so will go and pay at the checkout. Tui: Thank you for your help. Jane: Goodbye. Hope you find all the other things that you need. There are now three ESL supermarket conversation tasks for you to do. By doing these tasks you will be able to practice having conversations and be much more prepared in the future if you ever need to talk about shopping at a supermarket. In this ESL supermarket conversation activity you need to read the following conversation and then answer the questions by choosing the best option to fill in each of the gaps. When you have finished you can use the get score button to see how many you got correct. Situation: Jane meets her friend Lucy at Tesco. Jane: Hi Lucy it's good to see you. How are you? Lucy: I am fine now but I wasn't well yesterday. Lucy: What variety do you like? Lucy: I also want to buy some apples. Jane: There are lots of different apples here. Lucy: These ___________________ look fine. I'll have two packets. Jane: Bananas are my favourite fruit. I have one every day at lunch time. Lucy: I want to buy mushrooms. I will get the Chestnut variety. Jane: I enjoy making __________4_________. Lucy: My quick and easy snack is scrambled eggs. I do occasionally make omelettes. Jane: What will you make using your mushrooms? Lucy: I going to make a large pan of _________5_________. Choose the best option (A-D) in the following five questions to fill in the blanks in the supermarket conversation given above. For the next ESL supermarket conversation task you need to write your own conversation. You can use the three conversations from above as examples. You need to choose the best words to use. You also need to decide how many people there are in the conversation. Try to write as much as you can and include as much of the new supermarket vocabulary as you can. When you have finished you should find a friend and act out the conversation with them, so you can get practice at speaking the words. For the final ESL supermarket conversation exercise you need to have a conversation. You can use the following conversation card to help you. You should work with a partner and take one of the cards each, so one of you has question set A and the other has question set B. Then you take it in turns to ask each other questions. Try to say as much as possible when you are answering, and ask any extra questions you can think of. If you like these questions I also have a book of 80 ESL Conversation Cards that you can download. 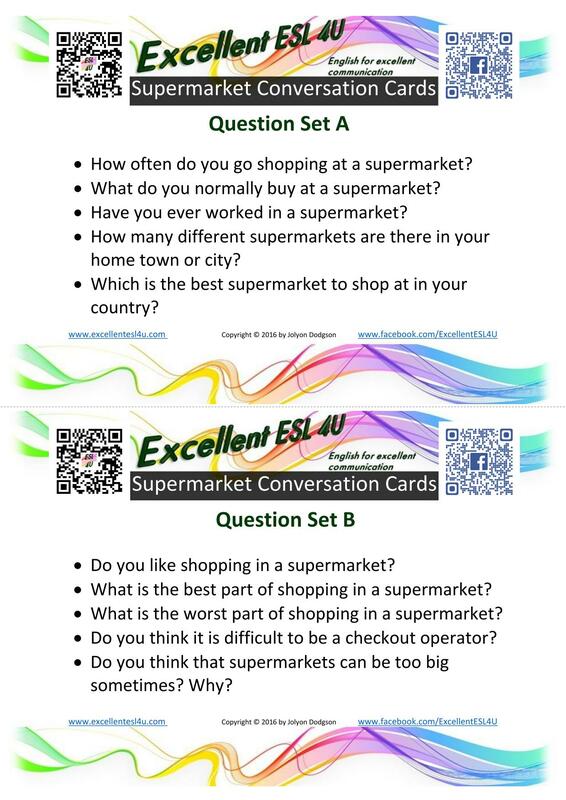 The ESL supermarket conversation cards can be downloaded for free by clicking the picture that follows the questions. How often do you go shopping at a supermarket? What do you normally buy at a supermarket? Have you ever worked in a supermarket? How many different supermarkets are there in your home town or city? Which is the best supermarket to shop at in your country? Do you like shopping in a supermarket? What is the best part of shopping in a supermarket? What is the worst part of shopping in a supermarket? Do you think it is difficult to be a checkout operator? Do you think that supermarkets can be too big sometimes? Why?